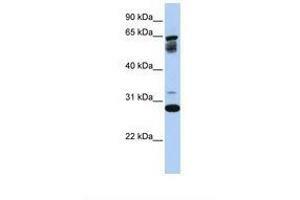 anti-TMEM187 抗体 (AA 146-195) | ABIN320944 Product No. 免疫原 Synthetic peptide located between aa146-195 of human TMEM187 (Q14656, NP_003483). Percent identity by BLAST analysis: Human, Gorilla, Gibbon, Baboon, Monkey (100%), Rabbit (85%). 预测反应 Percent identity by BLAST analysis: Rabbit (85%).